Sonax Wheel Cleaner Full Effect. The best wheel cleaner in the whole Universe. If you drive a sport compact or even a lifted truck, chances are you may have aftermarket wheels. Aftermarket wheels come naturally for those of you who want to enhance both performace and looks of your car or truck. However there is a menacing chore no one likes to admit doing. And that is cleaning up the brake dust. If you have polished wheels, or worse a light colored powder coated finish, your going to notice the brake dust after just one session of driving. Brake dust is usually a dark and grimy residue that will build up over a period of driving. If you leave this uncleaned or untreated after long periods of time, the brake dust will eventually embed itself into the wheel. You will have a caked-on mess to clean outside the wheels, as well as inside the wheel barrel. If your car comes with a larger factory caliper, or if your using a racing brake pad you will also see an increase in brake dust. Cars such as the Mitsubishi Evo, Subaru STI, Nissan 350, GTR, and just about every Porsche will utilize a large factory caliper. Heck anything fast will be equipped with larger factory calipers. Typically when you notice the brake dust problem, you will notice that the front wheels will be darker than the rear wheels. Okay now that we’ve identified the problem, can we go to the local auto parts store and get some wheel cleaner? Sure you can. However they will be fair weather at best. With wheel cleaners it’s mostly a spray on, leave on for a few minutes and spray off. But usually your off the shelf wheel cleaners, you will have to use a brush and scrub them well during the cleaning process. 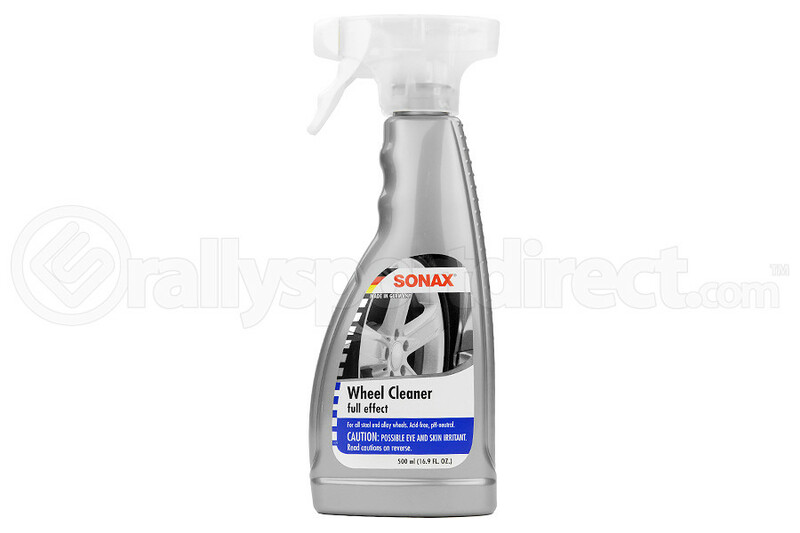 So what set’s apart the Sonax wheel cleaner from all the rest? Well most professional detailers will tell you hands down that it is the best wheel cleaner. It has an iron-x effect. 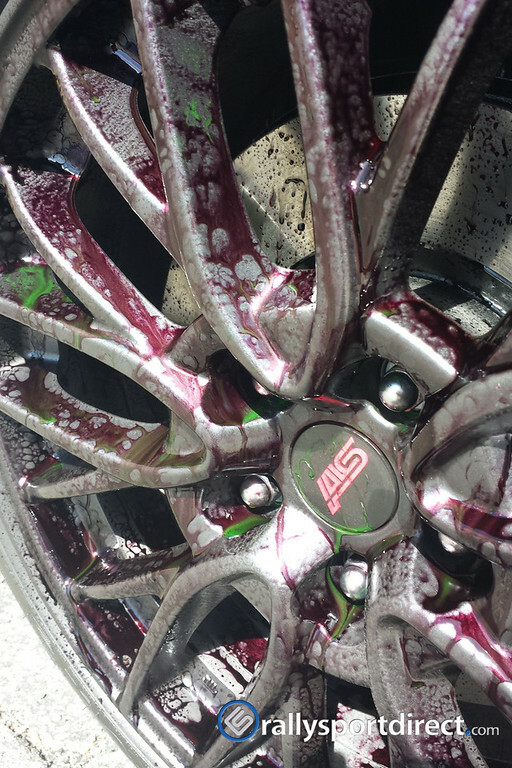 Meaning that after applying the cleaner to your wheels, it will change colors when it’s working-going from yellow to purple when it’s ready to be sprayed off. Sonax wheel cleaner also works more effectively compared to most wheel cleaners. If you’ve got caked on brake dust, oil or rubber grime, it will take care of it. Best of all, it is acid free for those of you who may own Volks, CCW, or any other high end wheel. 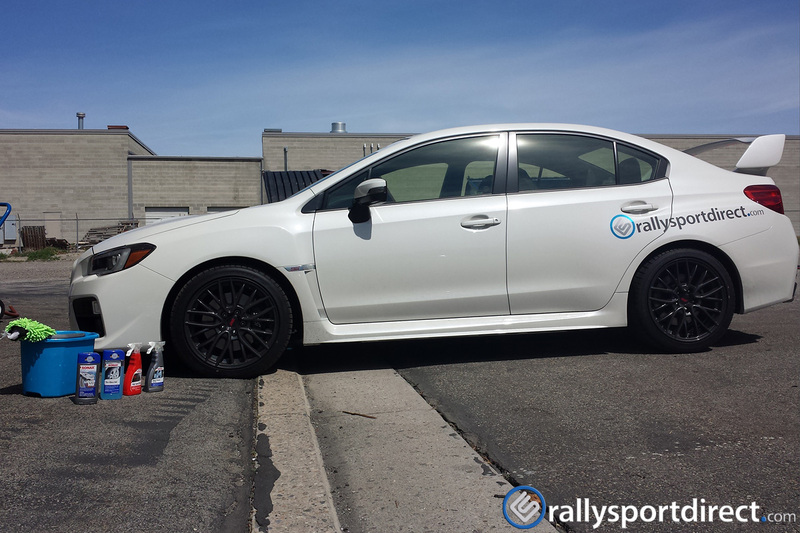 Visit us at www.rallysportdirect.com, and visit our cleaning section for Sonax Wheel Cleaner Full Effect.